What we need is to love without getting tired." 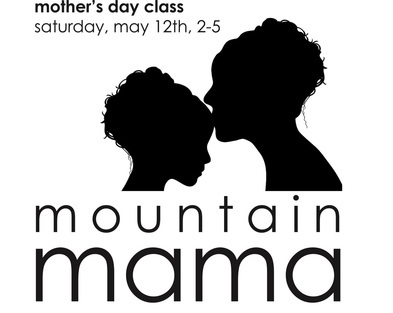 Treat your mom — or the mom you are — not with chocolate or brunch, but with a deluxe, 3 hour, Mom-pampering yoga class led by Mountain Yoga's own teacher-mama Erin Colom! We'll stretch, move, laugh, and honor our sacred mother selves. Together we'll open hips, shoulders, and heart. Our mantra will be " leave the laundry right where it is and breathe." Enjoy an afternoon all your own, or bring a loved one! Erin Collom teaches the Monday morning class at Mountain Yoga. Her classes provide a sequence, modiﬁcations, and pace which meet the physical and emotional needs of every student in the room, Erin’s own 23 year Yoga practice has guided, empowered, and supported her life path.